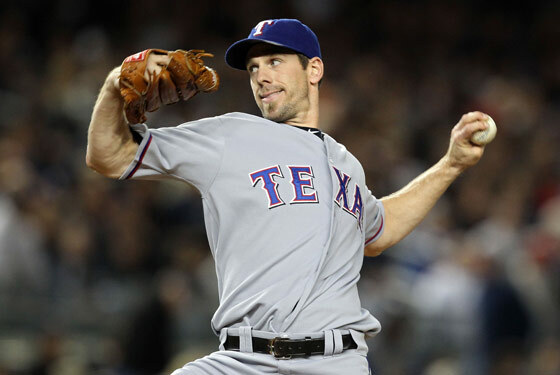 The Rangers' Cliff Lee was masterful yet again last night in New York, striking out 13 Yankees in eight innings without allowing a run as he helped push Texas ahead, two games to one in the American League Championship Series. For their part, the Yankees squandered their best pitching performance of the ALCS to date, letting Andy Pettitte's seven inning, two-run effort go to waste as they not only failed to score a run, but also watched in horror as the bullpen imploded to let six more runs score in the top of the ninth, putting the game out of reach. For the Yankees, whose starting pitching as they entered the post season had consisted of a Cy Young candidate followed by a bunch of question marks, the loss had to be particularly disappointing. Pettitte turned one of those question marks into an exclamation point with a seven-inning, two-run performance against the Twins in the Division Series, then repeated the feat last night against Texas in wasted effort. In fact, Pettitte really only made one mistake all night, the home run he allowed to Josh Hamilton, which came on a 3-2 cutter that he left out over the plate. Hamilton's famously injured ribs have kept him from being particularly effective against good fastballs, but he's been able to catch up with off-speed pitches, especially when they've been left out over the plate, as he did with CC Sabathia's slurve on Friday night, and as he reminded us last night. Pettitte could have won this game, perhaps should have won it. He's the most experienced post-season pitcher in major league history, with more Wins, more starts and more innings than anyone who's ever lived, and those all by large margins. Nineteen times in his career he'd allowed three runs or fewer in a postseason start with New York, and the Yankees had gone 16-3 in those games. In two of those three losses they scored no runs at all, and of course last night makes their record 16-4 in such contests. If they could simply have gotten to Cliff Lee, or, barring that, tired him out soon enough to get him out of the game and take a few shots at the Rangers' bullpen, they might have won it. Heck, the man was ready to come back out for the ninth when he'd already thrown 122 pitches. They might have seen him tire in the ninth, or at least gotten his pitch count up to 135 or so before their night was over, perhaps preventing him from being quite so effective in a Game Seven scenario. But alas, they could do neither. The so-called "plan" for facing Cliff Lee is to either to be aggressive and swing at the first pitch - because he throws a lot of strikes - or to be patient and wait for your pitch, because he also throws a lot of pitches that look like strikes, but aren't. Which is to say that there is no effective plan, or somebody would have already made a fortune by selling it to the Yankees. The real problem wasn't Andy Pettitte or (obviously) Kerry Wood, who continued to do his job very well in retiring the side in the 8th inning. It wasn't even the Yankee hitters, who managed only three baserunners the entire night, and only got one of them past first base. The problem was that Girardi missed an opportunity with his bullpen in the ninth inning. No, I'm not talking about the manager's refusal to use his closer in a tight game in the ninth inning. I think with two more games in the next two days and a bullpen full of generally effective, well-rested relievers, using Boone Logan and David Robertson is exactly what Girardi should have done. It's just not the way I would have done it. 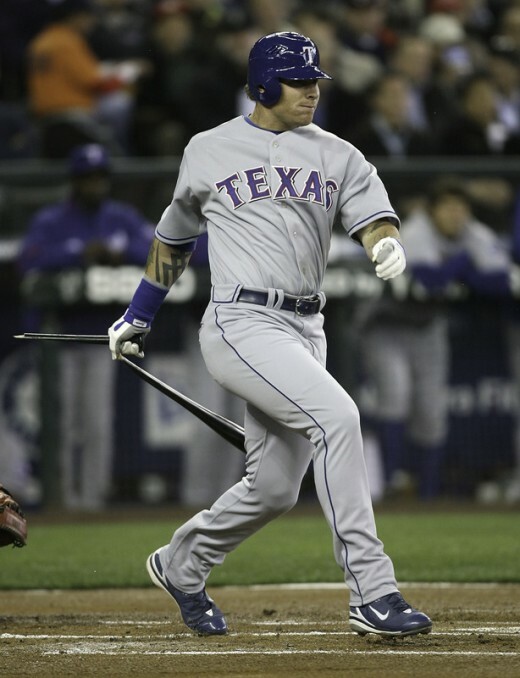 Logan was exactly the right choice - the only choice, really - to face Josh Hamilton leading off the ninth inning. He's the Yankees' only lefty reliever, and he held lefties to a .190 batting average with only one extra base hit all season. In his career in the major leagues, lefties have hit only .248, while righties have hit .325, so there was no question that this was the man for that particular job. Granted, he didn't actually get that job done, but still, they had no better options, really, once you took Mariano Rivera off the table. And I'm not entirely certain that it was Logan's fault either. He threw a 95 mph fastball to the outer edge of the plate and Hamilton did all he could with it, i.e. slap it to left field. But Brett Gardner and Curtis Granderson were inexplicably late getting to the ball, which scooted past both of them, all the way to the and Hamilton went to second easily. Logan's night was over. Girardi then brought in David Robertson to face the right handed hitters coming up: Vlad Guererro, Nelson Cruz, Ian Kinsler, etc. A seemingly good move, in that Robertson strikes a lot of batters out and gets a lot of outs on pop-ups, which should theoretically keep Hamilton from going any further, right? Except that Guererro is all but impossible to fan, so he singled a 1-2 curveball, which was actually an excellent pitch, below the strikezone, into left field, moving Hamilton to third. Julio Borbon ran for Vlad the GImpaler (I just made that up! ), giving the Rangers a little more speed on the basepaths. So now the Yankees have to deal with runners on first and third with nobody out, and they're down by two runs. Not a good situation, but not impossible. The Rangers' best hitters have already batted and their opponent in the ninth inning will be either a potentially tiring Cliff Lee or someone from the Texas bullpen, a bullpen that has recently shown some weaknesses. Do you give up the run on third base in order to try to get a double play? Or do you try to cut down the run at home? Girardi went for the latter option, bringing the infield in to try to keep the two-run deficit where it was, but in doing so, he squandered an opportunity to go to the ninth inning down only three runs instead of, you know, eight. Robertson - who is a fairly extreme fly ball/strikeout pitcher - went against his character by inducing a ground ball off the bat of Nelson Cruz. Unfortunately, it skipped past the drawn-in Derek Jeter and Alex Rodriguez into left field, plating another run. Then, inexplicably, Girardi kept the infield in again. Ian Kinsler has some speed, but he was also doubled up 11 times in the regular season, so it might have been possible to turn two. Regardless, Robertson reverted to form, inducing a strikeout with a curveball in the dirt, but Cruz advanced to second on the wild pitch, giving the Rangers an open base. Pinch-hitter David Murphy was intentionally walked to load the bases, and finally Girardi realized the futility of pulling the infield in, just a bit too late. Bengie Molina, who is so large that the Giants had to trade him away (he and Pandoval were making their making the field tilt when they both played), should be an easy guy to double up, given how he'll swing at just about anything and can't run at all. But alas, yet another grounder snuck between Jeter and A-Rod, playing close to the third base line to prevent a double, I think, which plated another run. It wasn't Robertson's fault. He delivered another good curveball, which broke below the strikezone, bur Molina got hold of it and it found its way through. Jeter ranked 20th out of 21 qualified MLB shortstops in Range Factor this year, and Rodriguez was 15th out of 19 third basemen, making them, I think, the worst rated left side of the infield combo in the majors, and it showed. Mitch Moreland then singled to right field, for a change, this time on a fastball from Robertosn that was down and in, again a pretty good pitch, the result of which snuck between Mark Teixeira and the first base line, and plated two more runs. Robertson then battled shortstop Elvis Andrus, getting the count to 2-2 before leaving a fastball about belt high over the middle of the plate, and was reminded that even guys with "warning track power" can actually hit the ball pretty quickly to the warning track if you leave a meatball out there for them. Andrus' double sailed just over the outstretched glove of right fielder Nick Swisher, plating yet another run, and mercifully endiN. Robertson's night. Sergio Mitre came in to mop up and needed only five pitches to retire two batters, though even one of those went wild and allowed the eighth run of the night to score. In the bottom half of the inning, Neftali Feliz retired all three batters he faced, fanning two of them. Why they'd bother using their best reliever in an 8-0 game is beyond my comprehension, but perhaps the 20 pitches he threw last night will make him less effective tonight if they need him. Obviously, a baseball game is not as cut and dried as one might like. It's an agglomeration of lots of moving parts, many of which are all but unmeasurable. But in the midst of wondering whether the Yankees should have done something different against Cliff Lee, who seems to thrive no matter what you do, or whether they should have burned their closer in a game they were already 92% likely to lose, it's worth wondering whether it was really a good move to bring in the infield three times in a row. Especially on the left, where the infield defense already has painfully minimal range, you've reduced that even more. And all of this on the off chance of getting a flyball pitcher to not just induce a grounder, but to induce one directly at one of the infielders. And then to do that two more times, after it doesn't work the first time, just seems asinine to me. Hopefully Girardi won't make such a call tonight. Hopefully AJ Burnett finds the form that helped him win 13 games last year, and 18 the year before that, and The Yankee bats awake again and Girardi has only to worry about how much rest to give his starters as they go into the eight inning with a 13-2 lead, or something like that.